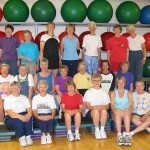 You Are Here: Home » Events » Healthy Aging Month part 3 – Physical Fitness: Do You Know How Much Exercise You Should Do To Stay Healthy? Healthy Aging® And Physical Fitness: Do You Know How Much Exercise You Should Do To Stay Healthy? Physical Activity Guidelines — You Can Do More Than You Think You Can. Interviews of elite athletes done by staff for Healthy Aging® show that at least one hour of cardiovascular activity a day is a key to fitness. The U.S. Department of Health & Human Services has announced what it feels is the way for adults to gain substantial health benefits through moderate aerobic physical activity. They say it is two and a half hours a week — that’s around 20 minutes per day for adults. The recommendations for children are one hour per day. Physical activity benefits children and adolescents, young and middle-aged adults, older adults, and those in every studied racial and ethnic group, the report said. Regular physical activity reduces the risk in adults of early death; coronary heart disease, stroke, high blood pressure, type 2 diabetes, colon and breast cancer, and depression. It can improve thinking ability in older adults and the ability to engage in activities needed for daily living. The recommended amount of physical activity in children and adolescents improves cardiorespiratory and muscular fitness as well as bone health, and contributes to favorable body composition. The Physical Activity Guidelines for Americans are the most comprehensive of their kind. They are based on the first thorough review of scientific research about physical activity and health in more than a decade. A 13-member advisory committee appointed in April 2007 by Secretary Leavitt reviewed research and produced an extensive report. Children and Adolescents — One hour or more of moderate or vigorous aerobic physical activity a day, including vigorous intensity physical activity at least three days a week. Examples of moderate intensity aerobic activities include hiking, skateboarding, bicycle riding and brisk walking. Vigorous intensity aerobic activities include bicycle riding, jumping rope, running and sports such as soccer, basketball and ice or field hockey. Children and adolescents should incorporate muscle-strengthening activities, such as rope climbing, sit-ups, and tug-of war, three days a week. Bone-strengthening activities, such as jumping rope, running and skipping, are recommended three days a week. Adults — Adults gain substantial health benefits from two and one half hours a week of moderate intensity aerobic physical activity, or one hour and 15 minutes of vigorous physical activity. Walking briskly, water aerobics, ballroom dancing and general gardening are examples of moderate intensity aerobic activities. Vigorous intensity aerobic activities include cycling, racewalking, jogging or running, swimming laps, jumping rope and hiking uphill or with a heavy backpack. Aerobic activity should be performed in episodes of at least 10 minutes. For more extensive health benefits, adults should increase their aerobic physical activity to five hours a week moderate-intensity or two and one half hours a week of vigorous-intensity aerobic physical activity. Adults should incorporate muscle strengthening activities, such as weight training, push-ups, sit-ups and carrying heavy loads or heavy gardening, at least two days a week. Older adults — Older adults should follow the guidelines for other adults when it is within their physical capacity. If a chronic condition prohibits their ability to follow those guidelines, they should be as physically active as their abilities and conditions allow. If they are at risk of falling, they should also do exercises that maintain or improve balance. Women during pregnancy — Healthy women should get at least two and one half hours of moderate-intensity aerobic activity a week during pregnancy and the time after delivery, preferably spread through the week. Pregnant women who habitually engage in vigorous aerobic activity or who are highly active can continue during pregnancy and the time after delivery, provided they remain healthy and discuss with their health care provider how and when activity should be adjusted over time. Adults with disabilities — Those who are able should get at least two and one half hours of moderate aerobic activity a week, or one hour and 15 minutes of vigorous aerobic activity a week. They should incorporate muscle-strengthening activities involving all major muscle groups two or more days a week. When they are not able to meet the guidelines, they should engage in regular physical activity according to their abilities and should avoid inactivity. People with chronic medical conditions — Adults with chronic conditions get important health benefits from regular physical activity. They should do so with the guidance of a health care provider. Be sure to check back for Next week’s Article: Healthy Aging And Nutrition: Diet News is Old News- It’s input vs. output! . . . or keep yourself up to date with what is going on at Belvidere Chiropractic Center by simply subscribing to Belvidere Chiropractic’s RSS Feed or to our Email Updates. You can also follow us on Facebook, Twitter, or LinkedIN. 2 Responses to Healthy Aging Month part 3 – Physical Fitness: Do You Know How Much Exercise You Should Do To Stay Healthy? Great post. Covers all the general age demographics. And right when I was about to suggest maybe getting nutrition in this series (since healthy aging also encompasses diet) You’ll be getting that into the next post. Good stuff, Dr. Heins. Thanks again James for taking the time to comment on my post and I am glad you liked it.